Meet Avishek Banerjee: Avishek joined Pega in 2009 and after working on several Pega Platform UI teams, moved to Pega Customer Service group leading the development of Pega Chat and Pega Co-browse as Development Manager. In August 2018, he took on the role of a Product Manager for Pega Customer Service focusing on the Chat and Messaging capabilities. He is also the Product Manager for Pega Co-browse. Avishek works out of Pega’s office in Hyderabad, India. And when he’s not working, his dogs keep him very very busy (and healthy)! Message from Avishek: Chat and Messaging are fast becoming the preferred channel for customers to engage with their service providers. Pega Customer Service is putting these channels at the front and center of the New Age Digital Contact Centers. Let’s talk about how you can make your customers successful with our out-in-the-open channels and the exciting new channels about to join the band! Have few question on pega chat install . pega chat install guide has the following pre-req software . is that a minimum software version requirement or do we have to install the same version . there seem to be more newer version of nodejs, redis and postpgres stable version now . our infr admin team want to get this confirmed . also, is pegachat 8 backward compatible to pega cs that is on 7.2.1 ? . thanks for your help. The Pega CS Chat Engine is developed using Node JS and Allied open source technologies. As you know, this is a very dynamic field and the pace of new versions coming out is very high. Although many of these versions are backward compatible, we need to test and certify against a specific version. Hence we pick the most recent stable version of our dependencies at the start of the release and develop and test on those versions. So, On-Premise customers should use only the versions that are mentioned in our documentation. We have found often that using a different version of the softwares causes malfunction and since we didn't use the versions our customers are using, we have limited ability to provide support. In an effort to remove the burden of managing 3rd Party software in their IT setup, we offer Pega CS Chat Engine as a cloud hosted service as well. For all new customers we are offering only the cloud service. For all existing customers, we will continue to support upgrades to newer versions, but we encourage them to work with their account teams to explore paths to move to our cloud service. Finally coming to backward compatibility support, Pega CS Chat Engine 8.1 is compatible with Pega CS 7.2. In fact any Chat Engine version is always compatible with older versions of Pega CS upto the 7.2.1 Customer Service version. If you find any compatibility problems, do send in support requests via GCS and we will be there to help out. thanks for the info . i cannot find the latest pegachat 8.1 install guide on pdn . please, can the pega documentation team upload it . we can check the pre-req software version dependencies. Since we are focusing on making the Pega Chat Engine primarily a cloud hosted service and making it much more integrated with Pega Customer Service, to improve the cost of ownership for our customers, we have discontinued the practice of On Premise Installation Guide. Having said that, we will continue to support all On Premise customers who intend upgrade to newer versions with documentation. If you are interested in upgrading, please raise an SR and we will provide you the documentation 1:1. Apologies that we cannot do it via this forum. thankyou Avishek , i raised an sr 2 weeks ago for the pegachat version 8.1 on-premise install guide . i had no luck getting the documentation . i only need to know what are the versions needed for pre-req software ( nodejs , redis and postgres) to install pegachat8.1 ( is it the same as v7.4 ?) . are the installation steps different in the new version ? . any help with this info is appreciated. Do you have any general rules of thumbs or thoughts regarding when Pega Chat is the preferred option over 3rd party chat tools such as Webex Teams, Slack, etc. Additionally where does Pega Pulse fit into this evaluation? The general rule of thumb about Pega Chat comes from the correct utterance of the functionality :) . It is actually not Pega Chat. It is Pega Customer Service Chat. Webex Teams, Slack etc. are standalone Chat and Messaging products great for collaboration. Pega Customer Service Chat comes integrated into Pega Customer Service and thus offers the complete suite of customer service functions. So, if you want a bunch of people to collaborate in real time or send notifications about build code checkins please use Webex Teams etc. If you want to operate a contact center where the Chat communication channel is integrated into a Customer Service product, can automatically enable user identification and verification and leverage the power of AI, Pega Customer Service Chat is your solution. As per Pega Customer Service installation guide, during installation of PegaCRM in Pega 8.1 Enterprise edition, the first step is to import the PegaCRM.jar file. While importing the jar file in Pega 8.1, I am getting the error "Import cannot proceed due to exception: java.lang.UnsupportedOperationException: Unsupported archive type: 6". You can also refer the attached screenshot. Can you please let us know why this is happening and steps to resolve the issue. Thank you for the help. As this question doesn't pertain to this topic, I would suggest you to post this in the general Customer Service forum or follow the regular support channels to get the matter resolved. Hi Avishek, what are some of the key considerations to implement Pega Chat in a support domain that is very transaction centric and where the business goal is to drive partners & customers to self serve? As a follow on my understanding is Self Service Advisor integrates (seamlessly) in Pega CS chat, can you elaborate on a typical set up and what it takes, not just technically but also for service owners, for that to be successful, again with an eye to self service. Thanks! Your understanding is pretty spot on. And you are heading in the direction where we want to take the Webchat capabilities - More Self Service. And the best way to do that upto Pega Customer Service 8.1 is to use SSA as the primary front for intercepting incoming service requests, guide customers through self service information (bot responses and knowledge articles) and then eventually escalating to Pega Customer Service Chat if the problem is not resolved. We suggest an upfront informational message on SSA informing customers how they can get to a CSR anytime they want (what's the command/text they need to type). question on postgressql . is that the only supported db ? is there a reason for that . i get these questions from my db admin team since oracle, db2 and sqlserver are the enterprise standard in our shop. need to justify . At this time postgresql is the only supported DB with the Pega Customer Service Chat Engine. The primary reason is priority and time, nothing technical. The usage of the DB in Pega Chat Engine is very limited and is becoming lesser with every new release. And with Pega Chat Engine becoming a primarily cloud hosted service, the DB layer will be transparent to customer. So, the compulsion to add support for more DBs is limited. We will surely consider, if we find postgresql limiting our abilities in any way. I'm new to Pega chat and I'm working on a new implementation, the problem I'm having is the chat is coming anonymous (unauthenticated). I did my research and all I see is I need to provide the ContactId which I did in the pre-chat answer with no luck. Is there anything I should look into? How can I get the customer information to be displayed to the agent when the chat is received? I also would like to use the email instead of the ContactId if possible to pull the information for the person who is chatting in. We are implementing Pega Cobrowse 7.3.1. Requirement is to enable cobrowse for CSR to CSR (Internal company cobrowsing). After initiating the session, only content is getting displayed not CSS. as per the installation guide, we added aditional step as it has to load Pega skin. fireflyAPI.set(‘isPega’, true); Still it does not work. PFA the document for screenshot. Please check and suggest. While this question is relevant for this session, which is specifically for Chat and Messaging, I will still respond to it as I am responsible for Co-browse as well. Please ask any follow-on question in the generic forums. Firstly, please refrain from using the version that you have. It is extremely old and the version which we have deployed on our cloud is 8.1. Next, please work with your Account Executive to either get a new account in our cloud server, or get information about any existing cloud account. Since September, 2018, Co-browse is a cloud only product. Fnally, the setting you have made is not relevant. If you really need to, you should use the SendStaticContent setting. But, I would suggest to use the 8.1 version. No special action will be required. This is a generic PRPC question and not relevant to this session. Please ask in a relevant forum. I am trying to create a case using webchat(Chatbot 8.1). I have specified the case type under the Content but when trying to simulate it in background many cases get created and it goes in a infinite loop . Can you specify the steps essential for creating a case using webchat channel? This is a generic Pega Platform question. Please refer to the Pega Platform guides to get the directions for your requirements. Thank you to everyone who asked questions and to @Avishek for being our expert! We can't wait to see you in a few months for your Ask the Expert session on Co-Browse! 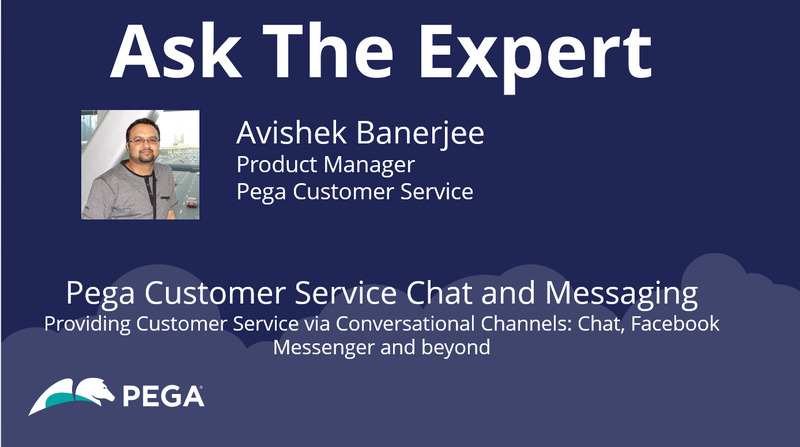 If you have a Pega Customer Service Chat question, please write a new post.